I really should be concentrating on finishing my uni work as my final submission date is in less than 3 months, but I decided to worry about my uni work later and play with pretty nail varnishes instead! 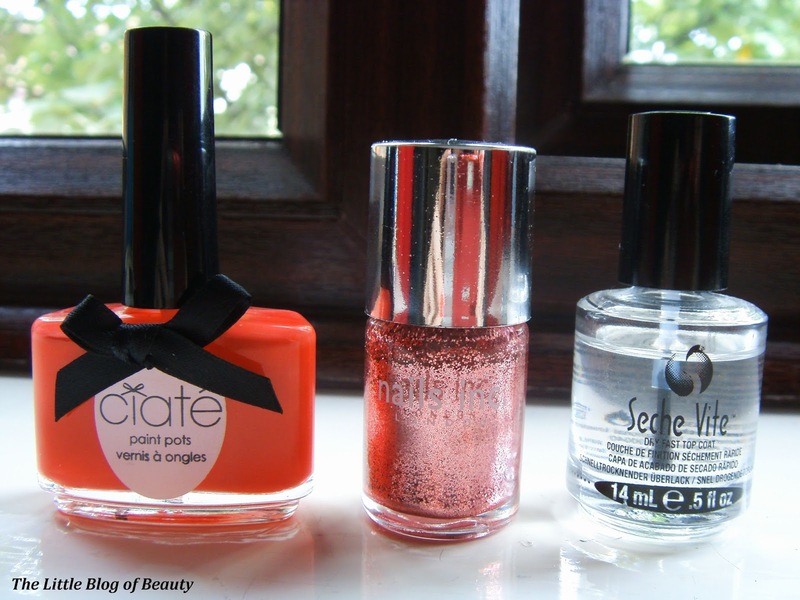 Although I cancelled my Glossybox subscription a few months ago I decided to order the July Seaside Splash box as a one off as it looked so good and I was really pleased to receive a Ciate Paint Pot as I've never tried one before. 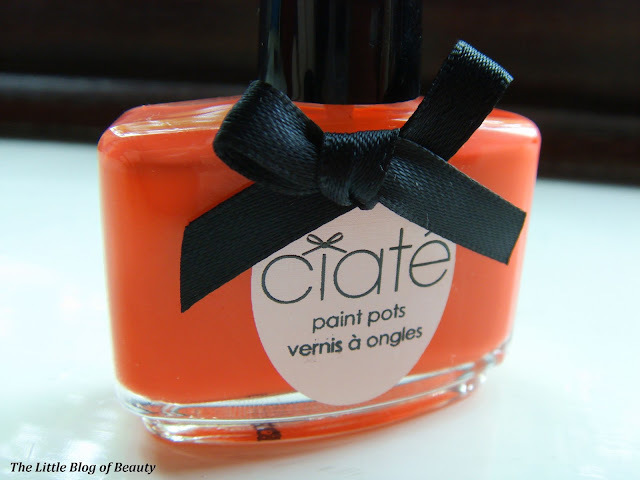 Ciate Paint Pot's come in really pretty little bottles which are slim and slightly curved and each one is decorated with a cute little black bow on the front. The shade I received was 'The Gossip' which is not a shade I would have personally chosen myself but which I now really like. 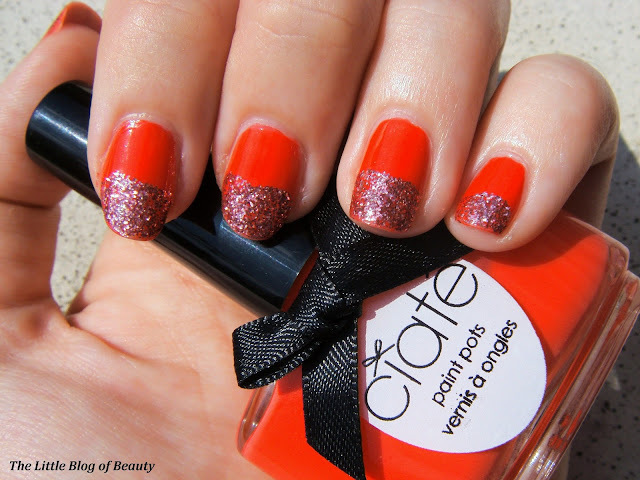 The Gossip is described as a vibrant peachy coral with a tutti frutti summer feeling. The picture of the bottle on the Ciate website is a good match for the actual colour but the swatch provided is a little too light. Whenever I look at this shade it always makes me think of Toffee Apples. As for the nail art I attempted I decided to try out glitter tips which was inspired by the lovely Fee over on Makeupsavvy. Fee's blog is one of my favourites and I would definitely recommend giving her a follow. First I applied a strengthening base coat as I'm currently trying to make my nails stronger (and hoping that my nail varnish will start to last longer). I then applied two coats of The Gossip and then used Nails Inc's Chelsea Square (which is a bronze glitter) just to the end of each nail. 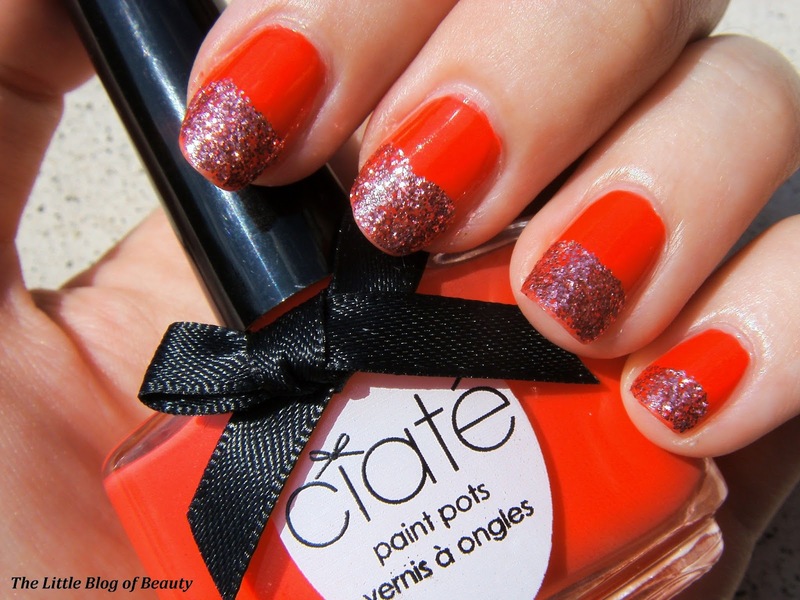 I then followed this with a coat of Seche Vite to make my nails super glossy and to provide a smoother surface over the glitter parts of my nails. I'm quite pleased with this although I think I would prefer if the glitter was just on the very tips of my nails (like a glitter French manicure) or if the glitter coverage increased moving out towards the tip of the nail. What do you think of my attempt at glitter tips?